This is the remote control of the TV in my hotel room. Yeah, the battery cover at the back is missing and they had to tape it to prevent the batteries from falling out. Then, I had to switch to another room a couple of days later and lo and behold, the TV remote in the new room didn't have the battery cover either. One day, I went to the reception counter and join the queue as I wanted a spare key card. The lady in front was complaining about depleted batteries of her TV remote. The reception staff was helping her tape the new batteries into her TV remote. EH! THIS ENTIRE HOTEL, THE TV REMOTES ALL DON'T HAVE BATTERY COVER ONE HAR!!?? Arrenn: You think I am asking too much of a hotel not to be so shoddy? Sure... How much are u willing to pay? 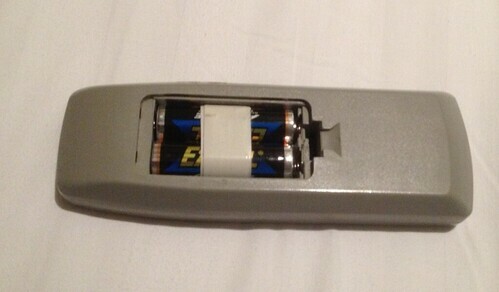 BigBrownBearBear: What I am paying should at least cover (no pun intended) the battery cover of my room's TV remote.